The days, they just keep coming. Thankfully, because the alternative would be bad, right? Right. I'm stringing together bits and pieces of good choices, which leads to good feelings, which leads to more good feelings. Momentum, I'm building up momentum. Slowly. Yesterday for breakfast I had...nothing. I forgot to eat breakfast. That hasn't happened in ages, but it was a hectic morning with the kids. I had coffee, of course, but realized mid-morning that I hadn't had my cereal. I had a peach and a string cheese and awaited lunch. I popped into WW for a meeting, my weight is officially 148.6 pounds, up 2.8 pounds from my last WW meeting in June and only .4 pounds from being officially over my goal weight. Pull it together Michelle. 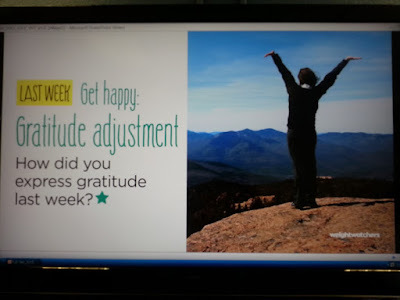 The topic from last week, which I missed, was gratitude. We spent some time reviewing it, which made me feel good. Counting my blessings always puts a pep in my step. 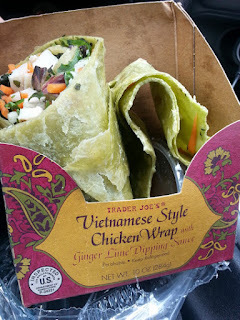 After the meeting I grabbed a wrap from Trader Joe's. I couldn't find the one I normally get so I chose the Vietnamese Style Chicken Wrap (w/ sauce, which I didn't eat - though I could have, I see now it was only 30 calories - next time!). It was yummy, I love pretty much all Asian flavors. I didn't eat the whole tortilla, discarding the bits toward the end that weren't needed to hold the wrap together. You know that part, right? 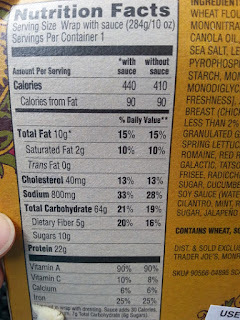 So lunch was 410 calories. I might have had a piece of fruit with it, I can't remember. I was hungry come afternoon snack, so I had a Fage yogurt with a banana. Dinner was out to eat, I shared a salami/cheese plate, had a few sips of wine, shared an Italian salad, and chose a grilled fish entree. Skipped dessert. All-in-all, I think I made good restaurant choices. For breakfast today I had oatmeal with splenda. I was tempted by other things but I held it together. Snack was a string cheese and a peach. Or was it a nectarine? No matter. 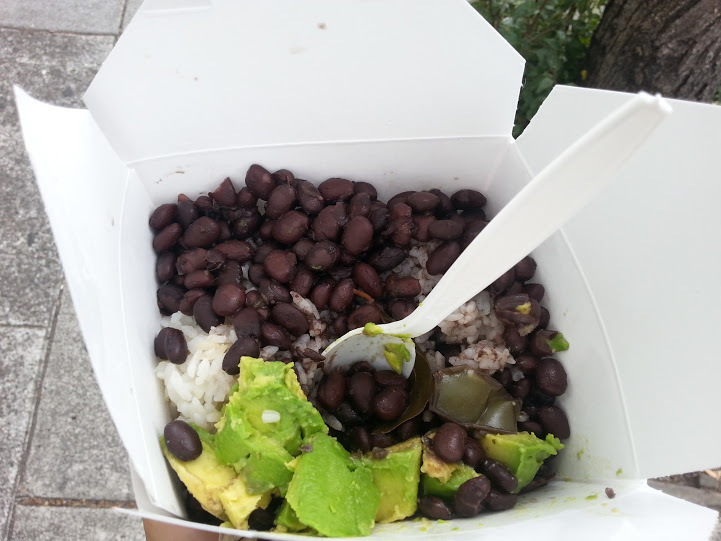 Lunch today was simple and delicious - white rice, black beans, avocado. All from Sol Food in San Rafael. After work I plan to go to the gym. I'm pretty sore from my workout the other day, being that I hadn't gone in a while. I'll have to take it easy today. I know part of what's challenging me right now is I'm knee deep in a bit of self-discovery. Oy vey, does it ever end? I guess not when you're the type that lives so much in your mind as I do. I might write more about this as time goes on, but for now it's a bit personal, though nothing unique. I'm just rediscovering what has been discovered, revisiting and visiting anew all that is old and within, uncovered, known and unknown - you know what I mean? Yeah, neither do I. At least food and exercise are somewhat simple, uncomplicated choices, because the rest of life's choices aren't always so easy. And still, I can do all this while making choices I feel good about in the food and exercise department. In fact, it bodes well for my overall experience of life when my behavior is in harmony with my goals. I'm going to close on that happy thought. 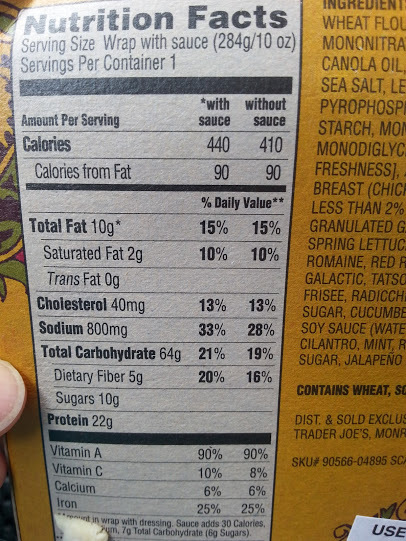 It was just announced that we're finally getting a Trader Joe's in late 2016--so in a little more than a year, I will finally be able to try out all these yummy looking foods that people always post about :D Try not to be too hard on yourself; you are exercising, and you are making good food choices. You have control over those things, even if everything else feels out of control. Thank you Christina. You're going to love Trader Joe's! Great post, Michelle! Losing weight and attaining healthy lifestyle in life shouldn't be too complicated. I believe we only need to eat simple and healthy foods to achieve a healthier lifestyle.